China: why so little airways? What's impact? - Why is this underdeveloped? Is it a matter of national security and/or protection of certain overflying areas? - Are there plans to create new routes? How is this impacting aviation in/over China especially given the exploding air travel needs of its citizens? - How long does it take to establish such new routes? - Why such an obvious absence over Tibet? Re: China: why so little airways? What's impact? AFAIK the military controls much of Chinese airspace. The PLAAF is pretty reluctant to release control over the airspace in general. As for Tibet, mostly due to its altutude. Let's say you have a cabin decompression, usually you lower the plane to 10,000-ish feet, but not over Tibet as you will be hitting terrain. Planes flying into the airports in the region are configured for the job (like carrying extra oxygen etc), thus you don't see planes overflying Tibet that are not heading for/departing from the area. Correct, when you have a cabin decompression over Tibet you can't fly lower than 14,000 ft and sometimes even higher. All planes flying over the region are specially configured to carry extra oxygen. You never want something unexpected to happen when you fly over the Himalayas. This is exactly why India/ME - East Asia flights go either via ZWWW region or ZPPP region - most planes, no matter widebodies or narrowbodies, are not configured in such way that will allow a safe passage over the region. As I recall, at least for a while, Chinese ATC would not hand off to Soviet/Russian ATC, necessitating routing all flights via Mongolia, which itself hand only one transit route, north-south over ULN. 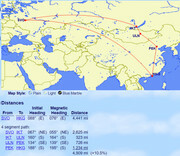 In one of MacArthur Job's books on the forensic study of air crashes, there is the story of Aeroflot #593, with a drawing of its chosen flight path, overflying Russia to Irkutsk (IKT), ULN, and PEK, before flying due south into HKG. The People's Liberation Army will continue to control the airspace until such time as the decision is made to open up more routes. You don't even have to fly in and out of Tibet for terrain to have a major operation impact flying over the Mainland. 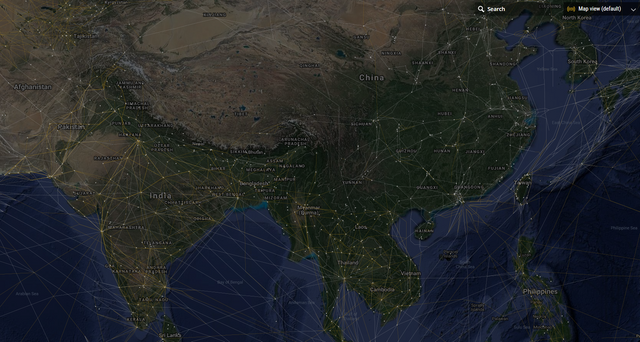 Overflying northwest China to/from Europe and East Asia, e.g. on the semi-famous Y1 airway, you have to use escape charts in case of a decompression or engine failure. There are also additional oxygen requirements because it might be a while before you can descend to 10000 feet after an event.